The sexiest position in America is CEO, according to a WhatsYourPrice.com study. The “Dating-for-Dollars” site pulled user data to determine which men have had the most success on the date-auction website. Entrepreneurs topped the list with 25 percent of the men owning their own businesses and being the most successful. Whether it’s the power or the status, WhatsYourPrice.com determined that women are attracted to successful men, particularly men that own businesses. WhatsYourPrice.com pulled data from approximately 145,000 male members to find which professions acquired the most date offers. America’s Sexiest Jobs from highest to lowest ranking are CEO/entrepreneur, financial adviser, software developer, lawyer, business consultant , physician, real estate developer, marketing/advertising executive, architect and engineer. WhatsYourPrice.com launched in 2011 and boasts more than 800,000 members worldwide. The website provides a platform where members can bid on a first date with an attractive member. MGM Resorts International is accepting applications from professional cooks who seek to broaden their experience under the guidance of skilled chefs at Bellagio, ARIA, The Mirage, Mandalay Bay and other MGM properties. Applicants to the MGM Resorts Culinary Associates Program will work in full-time paid positions for one year in the kitchens of MGM Resorts, guided by hands-on instruction from the resorts’ executive chefs. 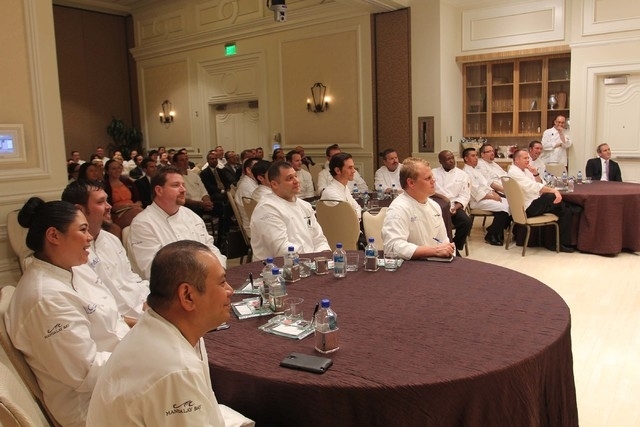 “This is a leadership development program designed to build future generations of culinary leaders, by providing exposure to kitchen operations in some of the finest restaurants in the world,” CAP Founder and Bellagio Executive Chef Edmund Wong said in a statement. Applicants must have at least one year of resort experience, and at least three years of experience in a lead cook position. The deadline to apply for the program is Friday, April 10. To apply, visit www.mgmresortscareers.com, select “MGM Resorts International Operations” from the drop-down menu, click “Search New” and enter “Culinary Associates Program”. Training for those accepted to CAP will begin July 15. Participants will complete monthly rotations in various kitchen environments, including production, high-volume and fine dining. They will also support special events, receive mentorship from property executive chefs, attend classroom training, and work alongside prominent chefs. In the most recent program, CAP participants worked with Charlie Palmer of Aureole, Roy Ellamar of Sensi, Matthias Merges of Yusho and others. The curriculum will also include food and beverage budget planning, purchasing, vendor relations, media training, and other aspects of leadership and professional development. CAP is the only program of its type on the Las Vegas Strip. Welcyon, Fitness After 50, a Minneapolis-based chain of health clubs specially designed for adults over 50, is making its Henderson debut this spring. The new club in Anthem Village Plaza will offer a personalized approach to fitness that combines strength, cardio and nutrition coaching. The Henderson club will be owned and operated by Dr. Mark Severino and his wife, Suzanne. Severino was previously a medical director and reproductive endocrinologist at Las Vegas-based Red Rock Fertility and Suzanne is a former fitness trainer who worked as an embryologist with her husband. At Welcyon, members are paired with a fitness coach and registered dietitian, who form a specific exercise and nutrition plan. Workouts are guided on strength-training equipment that use air instead of weight stacks to create resistance and build strength while minimizing the risk of injury. The equipment is powered by Smart Card technology, which pre-programs each member’s prescribed workout into every machine. Each machine greets the member by name, sets the resistance, counts reps and adjusts the workouts as the member improves. Boerboom said the Las Vegas area can potentially support up to five Welcyon locations. For more information, visit www.welcyon.com.